We can appreciate why the Twenty Series has been such a success, as these cymbals successfully blend Paiste´s clarity and definition with more exotic sonic characteristics. 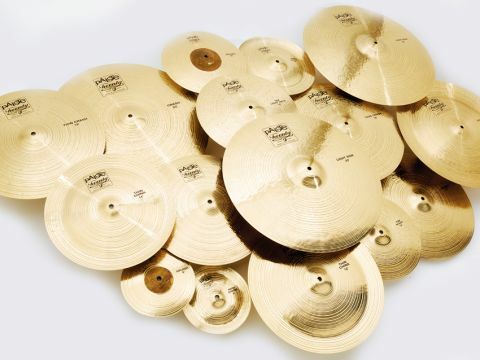 On the whole we found the thinner cymbals the most convincing, on the downside, Paiste´s legendary consistency wasn´t at its best where the 8" Mini China was concerned, and the cymbals do sport weighty price tags, especially since the prices have just gone up. ...unfortunately, one or two sound equally unimpressive. Launched in 2007, Paiste's Twenty Series cymbals are the first B20 cymbals the company has made since its Formula 602 and Sound Creation ranges. The brief was to bridge the gap between the classic sparkling, harmonious Paiste sound and the darker, more complex characteristics typical of cymbals of Turkish descent. The cymbals are a distinctive shade of gold and have been buffed to a gleaming shine. Wide and fairly deep lathing bands cover both the top and bottom of each cymbal from the centre hole to the edge (with the exception of the splashes and the normal weight rides, which have raw bells). Numerous hammer marks abound as well, so beneath the brilliant finish the cymbals have a busy surface. These new additions to the Twenty Series are a mixture of alternatively sized versions of existing cymbals and completely new models. First out of the box was a pair of splashes (8" and 12"). The 8" cymbal explodes immediately with a high-pitched snap. Although it is only 8" wide it seems alive with overtones. The 12"splash is big step up from the 8" and is altogether calmer. It's quite a thick cymbal and could almost function as a miniature crash. The weight gives it impressive volume and it possesses a similarly silvery, trashy voice to the 8". "Three new Thin Chinas and a regular China bring the total number of Twenty Series China options to nine. The Thin Chinas' combination of white-hot attack and underlying shimmering darkness is impressive". A new model - the Mini China - is represented in 8", 10" and 12" diameters. Of the trio, the 10" and 12" models sound the best, fizzing instantly in the style of a China while also possessing a proper note. The 12" is the most aggressive and also has the deepest note, making it an attractive add-on cymbal. The supplied 8" Mini China sounded nothing like the example on Paiste's website; we found it impossible to elicit anything other than an ungainly clang from it. Three new Thin Chinas (14", 16" and 18") and a 20" regular China bring the total number of Twenty Series China options to an impressive nine. The Thin Chinas' combination of white-hot attack and underlying shimmering darkness is impressive. Again the larger pair perform strongest, opening with searing aggression while brimming with trashiness. The 20" China doesn't have the same level of immediacy as the Thin models but it is louder and even more complex. Six new crashes are divided equally between standard and thin variants. The three Thin crashes (16", 17" and 18") retain some of the top-end clarity so distinctive to Paiste but feature a good deal of complexity as well. Their opening swell is rounded and harmonious while the note that follows is dark and mellow. Though it has no bell sound to speak of, the 18" Thin crash gives a delicate but clear stick sound when ridden. The three crashes (17", 19" and 20") are more Paiste-like due to their heavier weight. This ensures they cut through more and that their decay lingers for a while longer. They are still pleasantly deep in tone and strike a decent balance between warmth and cleanliness. The 20" crash was our favourite on account of its versatility - as well as supplying a good, loud crash it acts as a pretty useful ride too. A trio of new rides covers diameters of 20", 21" and 22". The 20" and 22" Light rides don't feature the raw bells of the straight rides on top, but, intriguingly, do below. They are both fairly lively and so a wave of wash builds up quite quickly when playing. The stick sound is fatter and deeper on the larger model but the wash - though it is not unpleasant sounding - is more of a distraction. We found they gave the best results when played gently - they are, after all, Light rides. The 21" ride has more focus about it, giving a clearer stick sound with less wash. Though it is higher in pitch it is still sweet sounding and can be played far harder than the Light rides without running out of control. Its raw bell is drier than the body of the cymbal but still cuts through. Of the four new pairs of Twenty hi-hats, three were sent for review (12" and 15" hi-hats and 14" Light hats), with the 16" Medium Light hats being withheld for review in a future issue. The 12" hi-hats are crisp and responsive, giving a tight, clean stick sound. There is a degree of warmth to them, but really they are all about precision - which they do very well. The 14" Light hats are an altogether darker proposition. They have a far softer feel, which makes for a big, warm stick sound. While enough top-end is present to ensure that they carry, these hats are happiest delivering a sizzling, slightly hazy performance. Being regular models, the 15" hi-hats are heavier than the 14" Light hats and consequently are a little more forceful. While they are undoubtedly a meatier pair of hats, there is nothing belligerent about them. Loud yes, but not harsh, and surprisingly controllable.